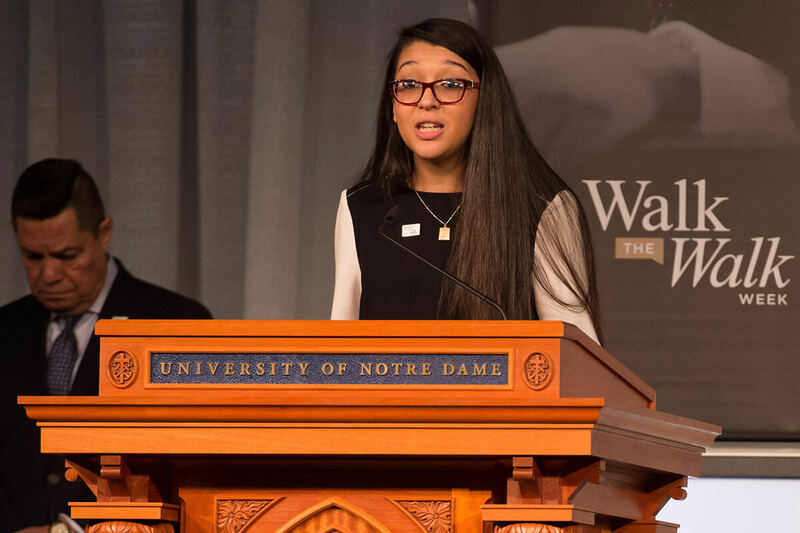 Sara Abdel-Rahim delivers the invocation at the Martin Luther King Jr. celebration luncheon, part of the 2017 Walk the Walk Week. Sara Abdel-Rahim ’17 found her voice in the liberal arts — and she amplified it through research, internships, and leadership roles on campus. As a first-generation American citizen, the political science and Arabic major wants to battle against cultural and religious discrimination. She’s delved into issues of immigration and integration through research projects, studied public policy during a semester of classes and internships at think tanks in Washington, D.C., and worked side-by-side with a professor analyzing concepts of citizenship after the French Revolution. For Abdel-Rahim, who was an Arts and Letters Dean’s Fellow and president of the Muslim Student Association, the College’s emphasis on community fostered countless opportunities for her to engage in intercultural and interreligious dialogue with her peers. Now in Greece conducting research after winning a Fulbright grant, her voice is stronger and more confident than ever. Originally published by Carrie Gates at al.nd.edu on July 11, 2018.